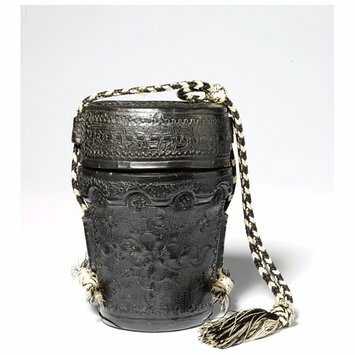 This leather case may have been made to protect a gold kiddush cup given (according to the Hebrew inscription on the lid) by Isaac son of Jacob to a congregation named for his father Jacob Halevi. 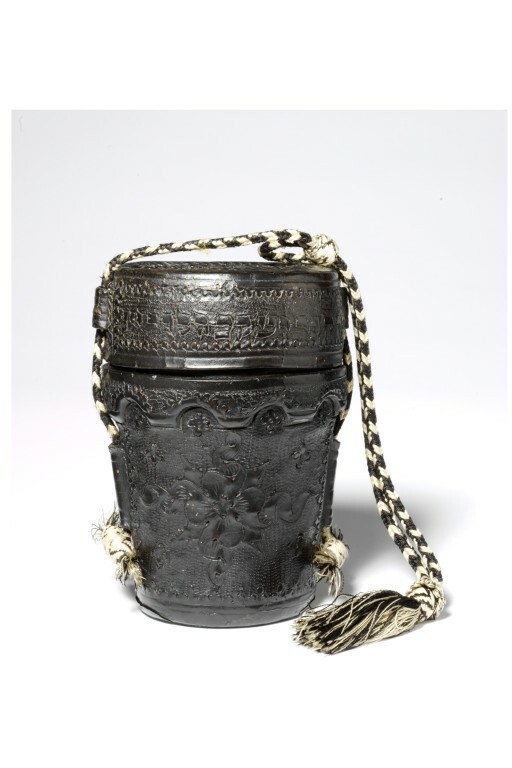 The kiddush cup (kiddush goblet, kiddush beaker) is a goblet used for drinking wine in Jewish religious ceremonies on special occasions such as wedding or in the benediction before the evening meal preceding each Sabbath or a holy festival. Ordinarily there is no special form for these cups and any type of wine cup may be used. Boiled and sewn leather, formerly light-brown, now sable. Circular upright form. Shut-over flat-topped cap and embushment. Cap in two layers, the top decorated in relief with a rosette and concentric design of quatrefoils and bead border. Round the sides of the cap, an inscription in Hebrew characters. Two eyes for a thong long wanting corresponding with eyes of the container. No lining. On the container of two layers of stitched leather, below a relief rim of round arched arcading, a pair of large quatrefoil flowers surrounded by 8 small quatrefoil devices and a trefoil border using the same semi-circular punch used elsewhere on the case. Inside, one vertical seam. No lining. Under the base, incised concentric circles. Thong replaced by a recent black-and-white cord. This cord is a modern replacement, white and black being Ashkenazi colours, found also on men's prayer shawls. to be: Isaac son of Jacob is the donor of the object (for which the case was made) to a congregation (kuf kuf would stand for kehillah kedoshah or holy congregation) named for his father Jacob Halevi. 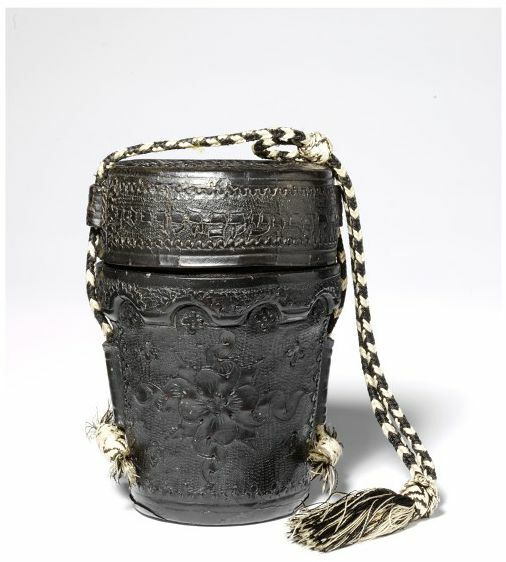 As gold kiddush cups were given to a number of congregations in the Rhineland in the 15th and 16th centuries, it seems plausible that this case was made to enclose such a cup. This interpretation supercedes the earlier suggestion that this protective case appears to have held a ceremonial lamp (probably of glass) now missing. The inscription around the lid in Hebrew characters, having been translated as 'In memory of Jacob the Levite' and 'Isaac son of Jacob the Levite' which suggests that the lamp was a Yahrzeit lamp, used by the son Isaac to commemorative his father Jacob the Levite. This case was apparently made to order to fit an existing lamp, which if made of glass would have been valuable as well as fragile. However lights specifically used as a memorial light are not known pre-late 19th century. Only one reference to leather was found among Salting’s (incomplete) papers at the Guildhall Library. It is possible that he bought most of his leather from auction sales (the papers for which have not all been checked, 12/2006). It is possible that his interest in leather began, like his interest in renaissance furniture begins during 1884 (after the Spitzer sale, 1883 at which he was said to have spent £35,000, and the Fountaine sale, 1884). Lamp case and lid, boiled and sewn leather.